News & Events » Events » Workshops & Forums » Canada's New Wave of Environmental Law Reform: Tide Going In or Out? Canada's New Wave of Environmental Law Reform: Tide Going In or Out? 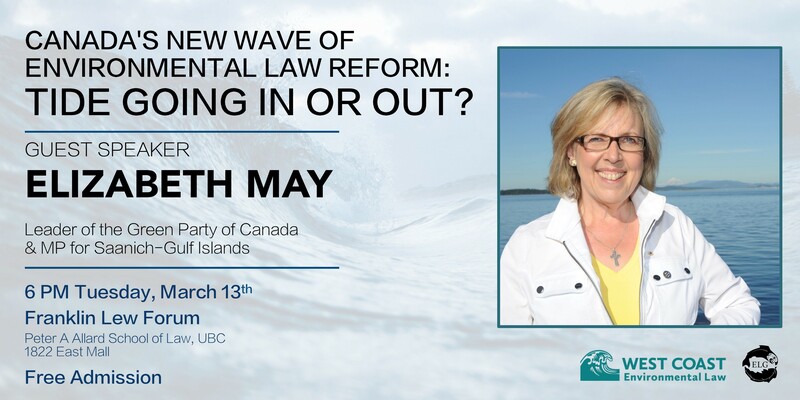 Join West Coast Environmental Law Association and the UBC Environmental Law Group for this exciting evening event featuring guest speaker Elizabeth May. With environmental pressures mounting in Canada and worldwide, the need for strong environmental laws has never been more important. As a respected lawyer and Leader of the Green Party of Canada, Elizabeth May will share her unique perspective on the legal profession and the evolving legal landscape in Canada. Hear about her career as an environmental lawyer, the difficult battles she's fought and won, and her current priorities for strengthening legal protections in Canada's Parliament. Come and be inspired, and learn how environmental law can and does make a difference for nature, communities and the climate. Elizabeth May is Leader of the Green Party of Canada and its first elected Member of Parliament, representing Saanich-Gulf Islands in southern Vancouver Island. In 2005, Elizabeth May was made an Officer of the Order of Canada in recognition of her decades of leadership in the Canadian environmental movement. She graduated from Dalhousie Law School and was admitted to the Bar in both Nova Scotia and Ontario. She practiced law in Ottawa with the Public Interest Advocacy Centre prior to becoming Senior Policy Advisor to the federal minister of the Environment (1986- 1988). For seventeen years Elizabeth served as Executive Director of the Sierra Club of Canada. A proud mother and grandmother, she lives in Sidney, British Columbia. Elizabeth is the author of eight books, including her most recent book "Who we are: Reflections on my life and on Canada."